Restrooms and fresh water showers are available. Small beach, with easy boat launch access, but waves can be large in late afternoons. There are no food or drink vendors in the area. The closest stores are located at the Shops at Wailea/Wailea Gateway Center. Check out South Kihei for Kihei Caffe for breakfast, 808 Deli for quick lunch. Cafe O’lei is a nice option for fresh fish. Nalu’s South Shore Grill in Kihei offers several healthy options and frequently hosts live music. Food trucks can often be found down by Makena beach. Free parking lot and some street parking available. Turtle Town is one of the most popular and recommended snorkeling destinations in all of Maui. Located conveniently along Maui’s south shore, Turtle Town is a wonderful place to witness a wide variety of marine life, some of which is endemic to Hawaiian waters and found nowhere else on Earth. On your next trip to Maui, we encourage you to join us to explore what makes this area so unique. Perhaps best of all, turtle sightings are guaranteed! Turtle Town is the name given to the general area between Makena’s One’uli Black Sand Beach and Nahuna Point. You may also hear it referred to as “Five Caves” or “Five Graves” due to the area’s many underwater caves and the graveyard that visitors pass when reaching the area from shore. 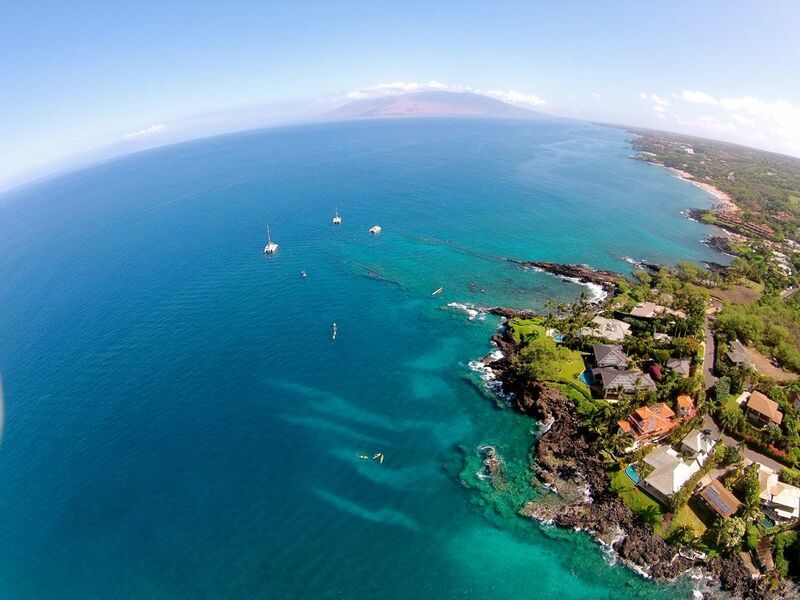 Whatever you prefer to call it, rest assured that it’s among the top snorkeling sites on Maui. If you plan on joining us for a private kayak tour or SUP lesson, you’ll depart from shore at Makena Landing and paddle to Turtle Town to experience one of the area’s many unique snorkeling spots. Why are they called "green" if their shells are brown? Green Sea Turtles are actually named for the color of their fat as opposed to the color of their shells, which is typically more brown than green. The fat is green due to their diet, which almost exclusively consists of seagrass and algae. Where can you find sea turtles basking on a beach? Sea Turtles in the Pacific have been observed basking on beaches, a rare activity only observed in a few parts of the world. Researchers think this may be done as a way to rest, avoid predators or warm their body temperatures. You can see this most frequently on Maui at Ho’okipa Beach Park on the north shore. When resting, honu can hold their breath for up to 4 hours, but typically surface for air every few minutes. Over time, the diet of a sea turtle will change from omnivorous to herbivorous. Young sea turtles will eat meat, while the older turtles typically do not. How can one tell the difference between male and female turtles? Want to know whether you’re swimming with a female or male honu? Males have long tails while females’ tails are typically much shorter. How long have turtles been in our oceans? Sea Turtles are believed to have been around for 150 million years. When do turtles start mating? Honu do not reach sexual maturity until 25 to 35 years of age. Turtle Town may have gotten its name from the large population of honu in the area, but long before it became a top recommended snorkeling destination, Hawaiian Green Sea Turtles made their mark in the spirit of the Hawaiian Islands. Considered ‘aumakua, or guardian spirits, by some ancient families, Hawaiian Green Sea Turtles were once used as a food source and utilized for medicine, tools, jewelry, containers, utensils, and as an offering to Kanaloa, the God of the Ocean. On the Big Island in the Pu’u Loa lava fields, there is even an ancient petroglyph of a turtle swimming. Since turtles are known for their remarkable ability to find their way home after long stretches of time in the open ocean, Hawaiians have related this to the same skills involved in ocean navigation, a longstanding source of pride for the Hawaiian population that originated with the first Polynesian settlers. Commonly featured in Polynesian art and tattoo design, honu continue to be highly respected as an integral part of Hawaiian culture today. Feeding on a mixture of seagrass and several varieties of algae, known as limu, sea turtles can be seen in large numbers everywhere throughout the Hawaiian Islands, and especially Turtle Town, where algae grows in abundance on the coral reef formations. Watch as they glide effortlessly over the shallow reef, through breaking waves and into underwater caves and you’ll see why they remain one of Maui’s most beloved animals. What Else Will I See at Turtle Town? Turtle Town developed underwater lava formations as submerged volcanoes erupted over time, creating the perfect swimming, feeding and resting place for several species of fish, including Parrotfish (Uhu), Butterflyfish, Trumpetfish (Nunu), Wrasse, Tang, Triggerfish, Humuhumunukunukuapua’a and more. You may also see larger species such as Octopus (He’e Mauli), Hawaiian Spinner Dolphins (Nai’a), Manta Rays (Hahalua) and Spotted Eagle Rays (Hihimanu). Lately, we’ve even been lucky enough to come across a couple of Hawaiian Monk Seals (‘Ilio-holo-i-ka-uaua)! In 1978, after suffering a rapid decline in population growth, Hawaiian Green Sea Turtles became federally protected under the Endangered Species Act of 1973. Under this rule, it is illegal to hunt, harass or harm the Hawaiian Green Sea Turtle population, and feeding, chasing or riding the turtles is always strictly forbidden. When snorkeling or swimming at Turtle Town, make slow and calm movements and you’ll find that they often don’t mind approaching you. Another major threat to the sea turtle population in Hawaii is toxic runoff from nearby golf courses, resorts, and homes, which can cause Fibropapillomatosis (FP), a debilitating disease which causes tumor growth, present on some green sea turtles found at Turtle Town. Fishing nets, plastic, boats, and sharks are also threats to the Hawaiian sea turtle population, so please help us in keeping our oceans a clean and safe environment!